At HP, our work on Megatrends is focused on directionally predicting where the world is headed, and about boldly ensuring a successful and relevant place in it for HP and our customers. In Issue 2 of the Innovation Journal, we discussed how four Megatrends—Rapid Urbanization, Changing Demographics, Hyper Globalization, and Accelerated Innovation—will have a sustained and transformative impact on businesses, societies, economies, cultures, and our personal lives in the future. Each year we revisit these four Megatrends to identify which Megatrend themes are accelerating, which are diminishing or changing, and what new themes are on the horizon. By 2030 there will be an estimated 8.5 billion people walking the earth. They will be drawn to cities in massive numbers for the promise of a better life. 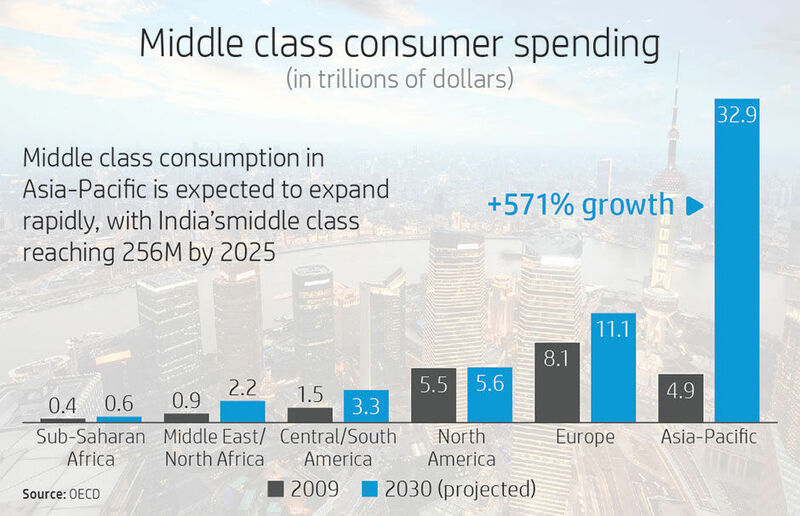 According to McKinsey, by 2025, urbanization will welcome an additional 1.8 billion consumers to the world economy, 95% of them in emerging markets. As economic conditions improve and social attitudes change, more women will have a major impact on the world economy, from growing participation in the global labor force to economic wealth and spending drivers. In the US, it is estimated that women controlled an estimated $14 trillion of wealth in 2015, and today influence 85% of all consumer purchases. While urbanization is also driving a growing middle class in emerging economies, in developed nations a rift is developing between haves and have-nots, with many consumers driven more by value than quality. As millions of people move to cities every week, this will also put a huge strain on space, city resources, energy requirements, and infrastructure costs, forcing homes, offices, and cities to become smarter and more efficient. From smart-city to micro-living initiatives, there will be an increasing focus, around the globe, on optimizing space, products, and services for urban living. We have a new generation about to enter the workforce, Generation Z (Gen Z), born between 1995 and 2010. Gen Z is about a quarter of the U.S. population and predicted to make up 36% of the global workforce by 2020. This generation was raised on the Internet, expects to communicate and digest information instantaneously, and has a shorter attention span for inbound information. As the online generation, Gen Z is acutely aware of the issues and global challenges happening in the world around them. 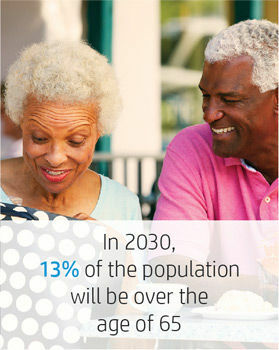 At the same time, by 2030 we’ll have twice as many people over age 65—nearly one billion. This is leading to a shrinking and aging workforce, putting a strain on economies, government spending, and healthcare. We will need to harness the exponential technology growth of faster computing, artificial intelligence (AI), big data, mobility, microfluidics, and the Internet of Things to help us meet these growing health challenges. How and where we design, sell, and manufacture products will become both hyper-global and hyper-local thanks to a globally connected world with a diverse set of local requirements. It’s now easier than ever for start-ups to scale globally, and for emerging market companies to become real challengers to established multinationals. This challenge will disrupt markets and business models. Companies around the globe must constantly reinvent themselves to stay competitive, and they must do so at a faster and faster rate. Companies that succeed will also have to be ready to handle new forms of payment, as for how consumers buy and pay for products and services is being increasingly digitized. People across the globe will soon be transferring data instead of cash. 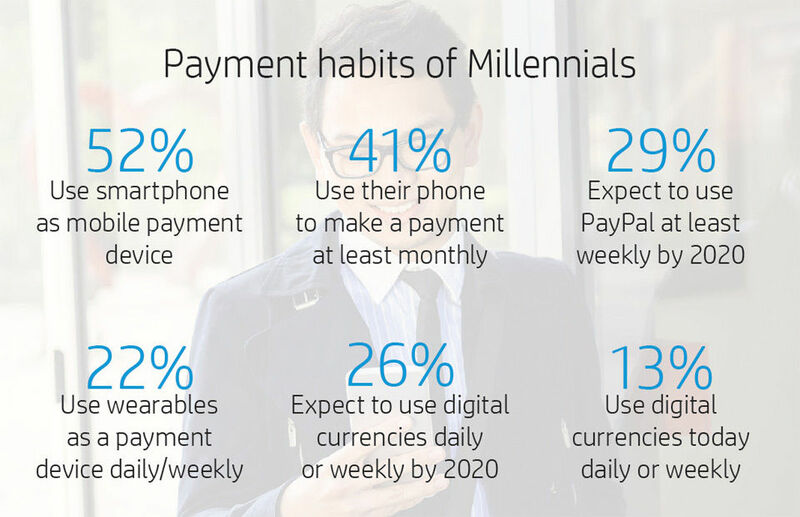 Online and mobile payments will lead to near-cashless societies in Norway, Denmark, and Sweden within 5 years. This trend is supported by Millennials—those born between 1982 and 2004—around the world. However, with the speed of global technology adoption also comes with an increased risk of cyber-attacks. Information is power, and cyber-attacks are hard to attribute as witnessed by the recent Democratic National Convention email hack during the US election. There will be an increased emphasis on technology companies to innovate and achieve much higher degrees of trust and resilience. The pace and breadth of innovation continue to accelerate. As new technology components mature and become commoditized, they transform into building blocks for new breakthroughs. Emerging technology trends like Hypermobility, 3D Transformation, Internet of ALL Things, and Smart Machines will harness advancements in computing power, connectivity, and immersive computing to deliver richer experiences. The rise of AI will lead to massive automation of tasks, manufacturing, and our workforce. The trajectory of manual job automation continues with the adoption of industrial and services robots across industries. However, it’s not just manual tasks that are being automated. AI and robotics are being put to work performing high-level cognitive jobs from healthcare diagnosis to publishing and advertising, and even making investment decisions in the boardroom. This “smart movement” will impact every aspect of our lives, with intelligent agents and bots always at the ready, orchestrating our everyday activities. The possibilities are endless for a Man + Machine-enabled world. So how will these trends shape HP’s future strategy and innovations? HP uses Megatrends to inform strategic, actionable choice points for our products and services. Megatrends give HP a directional look at how markets, industries, and behaviors are changing, and what type of solutions might be needed to overcome the challenges and demands of those shifts. Looking at short and long-term time intervals, HP identifies key technology advancements and new solutions that have the potential for the greatest impact. Starting with a pivotal choice point of deciding whether a new technology should be merely observed, is an incremental innovation—new feature or function, value-add to an existing product, or possible accessory—or a disruptive innovation, such as a new product or services. Each idea then goes through a rigorous business lens to understand strategic intent—opportunity, purpose, value—business rationale and actionable outcomes. Megatrends help HP shape today’s discussions and hypotheses, to deliver tomorrow products, services, and experiences.